Recorded in several spelling forms including Ackroyd, Acroyd, Akeroyd, Akroyd, Aykroyd, Ackred, Akred and Ecroyd, this is an English topographical surname, and specifically Yorkshire. It translates as "The dweller by the clearing in the oak tree", from the Olde English pre 7th century "ac" meaning oak and "rod", or the later royd, being a clearing or possibly even a farm. 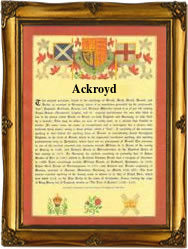 The name is believed to originate from a now "lost" medieval village in the West Riding of Yorkshire, possibly an area of the town of Halifax now known as Ackroydon. Some five thousand British surnames do derive from "lost" sites, of which the only record in the late 20th century is often the surviving surname, and then, as with this name, in a variety of spellings. The name development taken from authentic registers and charters over the centuries includes examples such as Henry Ackroyd in the Friary Rolls for the county of Yorkshire in the year 1645, and another Henry, this time Ackeroyd, in the same rolls but for 1648. However the first of all known recordings are to be found in London, where local dialect has influenced the spelling of the surname by the registrars. These recordings include Robert Acrid, who married Elsabeth Ridens at the church of St Bartholomew The Less, on June 15th 1589, and earlier William Acred, a witness at the church of St Thomas The Apostle, on May 4th 1572.